Omi (also known as Oombi) is a trick-taking game for four players in partnerships played in the island nation of Sri Lanka. Like in Court Piece, the trump suit is decided in the middle of the deal—you have to choose a trump before having your entire hand! Other than that, though, Omi is a simple game that plays much like many other trick-taking games. To win, a partnership just has to take more tricks than their opponents. The object of Omi is to score the most points by collecting tricks. Omi is played with 32 cards from a standard 52-card deck of playing cards. 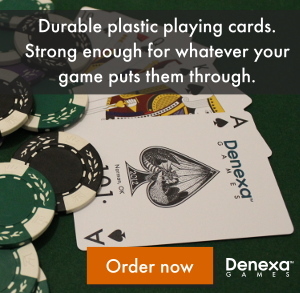 Take a deck of Denexa 100% Plastic Playing Cards and set aside all of the 6s through 2s. Your deck will then be left with aces through 7s in each of the four suits. Determine who’s partners with who in whatever way you like. You can just decide however you want, get some random method like a high-card draw to decide for you. However you decide, partners should sit across from each other. This should be done so that the turns will alternate as you go around the table. Traditionally, the discarded low cards (6s–2s) are used as scoring tokens. Separate them into two batches by color (red and black). Designate one player on each partnership to hold all of the out-of-play cards of one color. As a partnership scores points, the member of the opposing partnership that holds cards gives one score card for each point to the player on that partnership that did not start with any score cards. Thus, one partnership will be starting with black cards and receiving red cards from their opponents as they score points, and their opponents will start with the red cards and get black cards from their opponents. Shuffle and deal four cards to each player. The player to the dealer’s left, the declarer, then decides on the trump suit, using only these four cards. They cannot consult their partner for advice! Once the trump suit has been named, deal each player four more cards. Players will each have an eight-card hand. The declarer goes first. They lead any card they wish to the first trick. 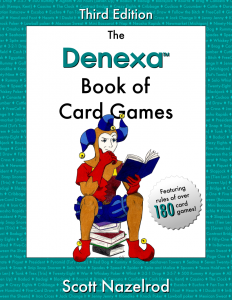 Each player in turn then plays a card from their hand to the trick until all four have played. Players have to follow suit if they are able. Otherwise, they can play any card, including a trump. Whoever played the highest trump wins the trick; if there are no trumps played, the highest card of the suit led wins. The winning player collects the four cards making up the trick and puts them in a won-tricks pile they share with their partner, being sure to keep tricks won later separate by placing them at right angles to the previous trick. Whichever player wins the trick leads to the next one. All eight tricks: Three points. Five to seven tricks: Two points for the dealer’s team, or one for the declarer’s team. Tied at four tricks: No points are scored for the hand, but the winner of the next hand scores one extra point. After the hand is scored, the deal passes to the left for the next hand. Game play continues until one partnership reaches a total score of ten points. That side is the winner.